Ask a small businesses owner/entrepreneur about his/her business, and you're likely to hear more than you ever wanted to know about widgets, gizmos, and gadgets. Chances are you'll learn about every part of the business in question—manufacturing, marketing, sales, even shipping. The one thing you won't hear about is finance. Oh, you might be told about the rising cost of materials, spiraling health-care costs, and perceived anti-small business tax issues. But rarely does it go much further. In truth, few entrepreneurs' passion extends to accounting, as difficult as that is to understand for someone like me—who followed his father's footsteps in the bookkeeping and accounting business. Still, after 30 years of working with small business owners and entrepreneurs—from manufacturing and the building trades to restaurants and high-end retail—I've yet to meet a single one whose passion was fueled by talks of debits and credits, assets and liabilities. At the same time, I've witnessed an ever-greater tendency among business owners to fail to fully understand, and keep tight control of, their most accurate indicator of success: finances. Financial documents—from those kept on the dashboard of a contractor's vehicle or stuffed into a shoebox in a desk drawer to elegantly presented volumes from an internal accountant—frequently go unheeded or, at least, not understood. All too often the business owner who takes pride in knowledge about his or her products and services has a much weaker grasp of the balance sheet and income statement. Not everyone (gasp!) aspires to be an accountant. As more than one of my clients has said, "That's why we hire you." But in today's ever-more competitive environment, the businessperson who doesn't understand that finance is the language of business is unlikely to be successful. Everyone has met (or been) the business newbie whose financial acumen is limited to a glance at a monthly bank statement to ascertain the company's health. It's akin to the popular concept that "we must have money in the bank, since we still have checks left in the checkbook." While that is more a joke than reality, I've witnessed similar feeble approaches to financial analysis. The decision about how financials are handled, be it an in-house accounting department, an outside bookkeeping/accounting firm on a contractual basis, or possibly even, a hybrid, an internal system with independent oversight, is an issue faced by all companies, large and small. But business owners often fail to have a handle on basic financial principals like cash flow analysis (simply put, where did the money come from and where did it go); timely bank statement reconciliations (yep, mistakes happen, and "I didn't pay attention" isn't an acceptable excuse); inventory valuation (is what could be the most valuable asset being accurately tracked? ); and cost of goods sold (volume is not going to help if the widget you sell for $1 costs $1.10 to make). Clearly, that kind of financial understanding requires on-going (year-'round) oversight. It's not something that can be done belatedly, in hopes of making up for yearlong in inattention. Still, although 2013 is almost half over, it's not too late to understand the importance of having a good mid-year package of the operating results (financials) of your company. • The most obvious value, of course, is to determine the type of income tax liability being generated. Without having a good set of financials, it's difficult at best to estimate your tax liabilities. This lack could lead to penalties, fines and, certainly, cash requirements (federal and state taxes) that were not anticipated. • It's not too late to be aware of your eligibility for any tax incentives (i.e., accelerated depreciation if available). Without having a good set of financials, the company's tax professionals cannot suggest steps to maximize benefits and take full advantage of tax changes coming from Washington to minimize the tax burden. • It's also very difficult to know where the company is headed if it's without a clear picture of where it is now. Proper financials would indicate if operational changes implemented have had a positive or negative effect on the profitability of the business in general. There is no business owner who doesn't want to maintain a change that increases profit or call a halt as soon as possible to an unprofitable change. Without good financials the impact of a change is a mystery. This kind of financial understanding is the business of every business owner. It is not something that can (or should) be delegated to someone else. After all, every business owner knows, the buck really does stop there. 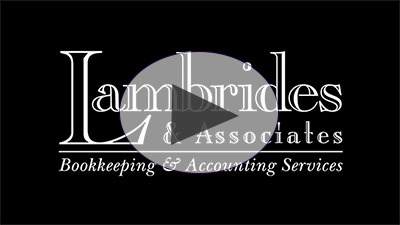 George Lambrides is the founder and president of the Portland area Lambrides & Associates, a provider of bookkeeping, accounting, and payroll services.